Merlot has an interesting history. Most closely related to Cabernet Franc, Merlot is extensively planted in the Bordeaux region, and is the predominant grape in the so-called “Right Bank” area, particularly in the regions of Pomerol and Saint-Émilion. One of the reasons for having so much Merlot planted in France is that Merlot typically ripens 2-4 weeks before Cabernet Sauvignon, resulting in Merlot getting to ripeness every year in France, where Cab grapes don’t always get to full ripeness. There is actually more Merlot planted in France than Cabernet Sauvignon, and it’s not even close. The different levels of ripeness, as well as the other varying characteristics of the Bordeaux grapes (taste, nose, body, color, …), allows/enables/demands blending of the grapes to get the best results. In the U.S., Merlot is the second most purchased wine behind Cabernet Sauvignon, even after the negative effect of the movie Sideways. (See the clip at the end of this post for a reminder.) This high standing with U.S. consumers is most likely due to Merlot not being made to be as full bodied and tannic as Cabernet Sauvignon, therefore being very accessible to U.S. wine drinkers. However, in the movie Sideways and in the wine industry press, Merlot was characterized as soft and flabby and not fit for a real wine connoisseur to drink. This is in contrast to the Merlot-based wines of Bordeaux, which include some of the great Bordeaux wines. 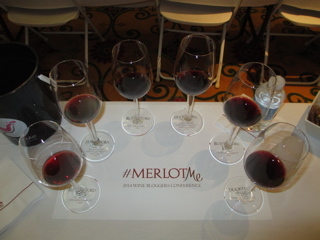 At the recent Wine Bloggers Conference, we had the opportunity to taste both styles of Merlot. (I’m not sure if that was the intention, or if everyone else had the same impression from the tasting, but this is my take on it.) Participating in the tasting were Rutherford Hill Winery and Duckhorn Vineyards. Both of these wineries have been in business for about 40 years, making them veterans of Napa Valley. As a reminder, a wine needs to be a minimum of 75% of a varietal to be called that varietal on the label. So all the blends here qualify to be called “Merlot”. This tasting reminded me that Merlot can be a wonderful wine. However, just like every other wine, make sure you know what you personally like and are looking for in a wine, and don’t let a movie or popular trends dictate your wine drinking habits. If you want to know my favorite(s) from this tasting, leave a comment for the blog and I’ll respond. If you’re interested, October is “MerlotMe” month, including a special tasting in San Francisco mid-month. This entry was posted in wine tasting and tagged Duckhorn Vineyards, Merlot, Rutherford Hill on August 2, 2014 by vvblogman.